When I was younger and all the girls at school were dying their hair fun colors of the rainbow or embracing the ever so awful trend of chunky highlights and dip dyes, I naturally begged my mother to bring me to the salon so I could jump on the bandwagon. Much to my dismay at the time, she gave me the ultimatum that I could get blonde highlights (as a natural blonde this wasn’t as appealing at that time) or nothing at all. Although I am 100 percent appreciative now, I don’t think my mother knew the monster she was creating. Since that fateful conversation in the 5th grade, I have consistently been going blonder and blonder with the odd experiment as a brunette here and there. I am by no means an expert in hair color, but after 10 years of sitting in the salon chair, and my own ventures with hair color at home, I have accrued some wisdom that I thought I’d pass on to all of you pondering a trip to the blonde side. The number of times I’ve gone into the hairdressers with pictures of Daenerys Targaryen or Gwen Stefani’s white blonde in tow, to be warned against and talked out of such a change is more than I’d care to admit. Going blonde is a big decision, and a damaging one to not only your hair but also your wallet, and your hairdresser will rightly do everything they can to warn you of that. I’ve heard everything from the likes of “To get this light, your hair will be fried”, “Do you really want to dye your whole head one color? It will be a pain when the regrowth starts”, to “I can get you there, but I will have to do it in 2 or 3 sessions”. The right hairdresser will be honest with you based on the condition of your hair and the color you are starting with. It will feel disappointing to hear your hair dreams can’t be met with a single appointment, but it’s better than having your hair fall out (a horror story of mine for another time). As I said before, from my experience it seems pretty rare that someone walks into the salon to go from brunette (or even dark blonde) to platinum in one go. Kylie and Kim’s overnight transformations are exceptions to the rule that are more than misleading. When going from dark to light, there’s no doubt about it, bleach will have to be involved. 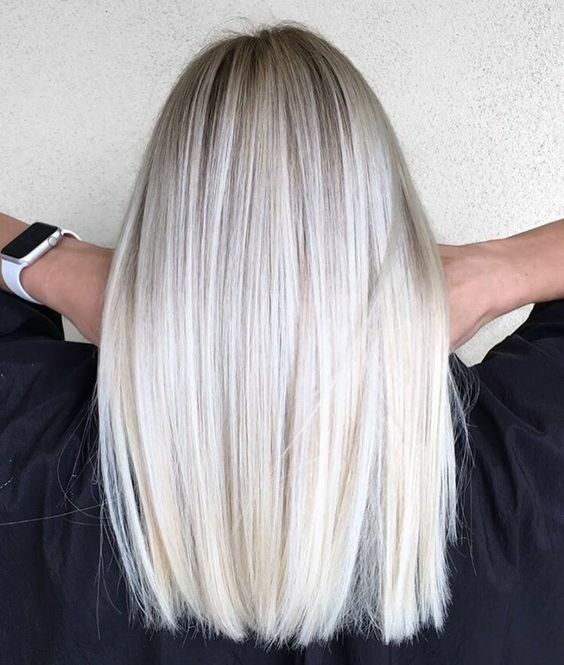 The bleach is going to strip the pigment from your hair leaving it lighter, but in the process, it’s also going to cause a lot of damage. Unless you have a stylist dedicated to spending 12 hours in the salon for a double process, with back up extensions on hand for damage control (read: lots of money in the bank) it’ll more than likely take a few trips to the salon. Patience is a virtue, and the satisfaction when you finally achieve the color you’ve been waiting for it is definitely worth it. It’s also fun to experience a multitude of looks, even if it’s not what you initially intended you can still love the colors you experience along the way to platinum. Bleaching is an unforgiving process, that will bring to light any hair decisions you’ve made in the past. Because you are removing color, you end up revealing what’s truly underneath, which isn’t always even remotely close to blonde (I’m talking about that blue temporary color you got in the grocery store that one time). Applying the bleach yourself is also a race against the clock, once the bleach goes in it starts doing its job, and doesn’t wait for you to finish up applying in the back; resulting in a beautiful light blonde to frame the face and a gingery orange when you turn around. That’s not to say it can’t be done, but if it’s your first time an extra set of hands would be an asset. And if you are going to do it yourself, make sure you have plenty of the bleach powder on hand, as that will be your saving grace when you need to strategically hand paint those (pumpkin) patches. Coming from someone who’s two hair products were a hairbrush and elastics, this is a true statement. After the damage inflicted on your strands, you’ll find your hairdresser urging you to invest in hair masks, protein treatments, and basically anything hydrating. You’ll be told to avoid sulfates found in drugstore shampoos, as well as heat styling. Platinum hair takes a lot babying but I’ve actually found joy in finding the perfect products for my hair. I use this as my regular shampoo, it smells as heavenly as an expensive spa treatment. This is a hair mask that works great as a regular conditioner. It leaves your hair physically stronger and is also great for de-tangling with a wide tooth comb helping to avoid damage brought on by a hairbrush. I use this once a week and let it sit in my hair for 5-10 minutes between my shampoo and conditioner. It helps to keep your hair an icy cool tone and prevent brassiness (I.e. your hair turning a yellowy orange tone). I usually let my hair air dry to avoid unnecessary damage, but will put this in to protect my hair from my curling iron or before blow drying on the days I’m really in a rush. If you go platinum from brunette, this may be more applicable. Depending on the tone you achieve in your hair you may need to switch your foundation. What previously worked with a warm-toned brunette will appear orange in contrast to an icy white blonde. I found myself reaching for lighter and brighter eyeshadow shades, and even ditching my eyeliner when I made the change. With lighter hair, I personally found it didn’t take as many products to make my eyes pop. Going platinum really is a transformation, and switching up your makeup is all part of the fun in changing your look!